Well, I’ve been asked about them more than once … including on live radio. I suppose that’s what comes from devoting an entire chapter in my book Team Us to the “killing” of old habits in marriage. And do you know what happens? Every. Single. Time. My mind goes blank. After which, I end up muttering something about Ted’s time management issues. A flaw for which with every additional interview I do, I think he’s slowly earning the reputation as poster boy. You see, in that Bill-Murray-Groundhog-Day-type-moment of mine, it’s all I can come up with. It’s not that Ted doesn’t have any other flaws. Of course, he does. He’d probably be the first to list them off for you. So my blank mind isn’t the result of a lack of flaws. Instead, it’s a happy outcome of my focus. A focus that has come about after years of practice. You see, I choose to overlook Ted’s faults. To let them go. But this isn’t a quality I naturally brought to our marriage. It’s the result of years of intentionally training myself to do so. It’s only easier now because it’s a habit that’s been formed with time; something that’s slowly becoming a natural reflex as I make an effort to be forgetful where it matters most. Thankfully, Ted has learned to do the same when it comes to my failings. And just for clarity’s sake, I’m not referring to excusing sin patterns Ted may have where there’s no improvement or desire to change on his part. You know, those things that could prove destructive not only to our marriage, but to Ted personally. I’m talking about those areas where he knows he could do better, but his progress might be slower than I’d like. So how do I overlook flaws? What’s my secret? How do I … let it go? And no, it doesn’t involve dramatically breaking into a certain charting-top Disney song. Well, not too often. While I certainly don’t practice it perfectly, the #1 way I’m able to do this is by directing my thoughts to what I like – and yes, love – about Ted. By purposely focusing on his good qualities. His strengths. For example, the ways he loves the Lord, our family, and others well. There’s a lot to like – and yes, love – about this man of mine. Showing your admiration to him is so important. You may think he already knows the things you admire about him, but in reality, we don’t tell our husbands often enough how much we do. So take the opportunity today! While she suggests actually sitting down and writing out a list of ten things, for me, I think sharing “10 Things I Love About You” to Ted in one sitting might feel unnatural. But what I can do is spread these words of affirmation over the course of a week or two – a text here, a magnetic letters on the fridge note there. It’s true that a surge is sometimes necessary – in a Middle East skirmish or a struggling first-world marriage – but in Ted and my just-fine marriage, spreading the love over a few days is perfect. 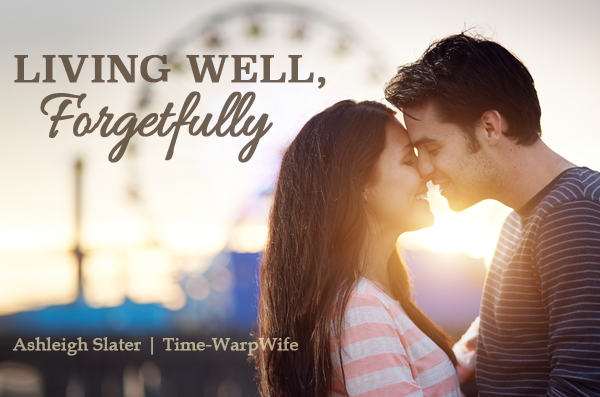 I can take the heart of this much-needed encouragement and flesh it out in a way that works well for our marriage. And who knows? Perhaps in my next book-related interview, I’ll even throw one of those things I admire about Ted in too … yes, on live radio. I predict that after days and weeks and months of intentionally sharing those things I love about Ted with Ted, I’ll find that speaking them out loud has become – just like living well, forgetfully has – another natural reflex. 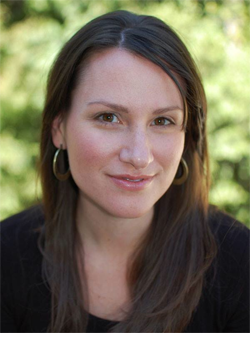 Ashleigh Slater is the author of the book, Team Us: Marriage Together (Moody Publishers, June 2014). As the founder and editor of the webzine Ungrind and a regular contributor at Start Marriage Right and iBelieve.com, she unites the power of a good story with biblical truth and practical application to encourage couples. She has almost 20 years of writing experience and a master’s degree in communication. Ashleigh and her husband, Ted, have been married for more than a decade. They have four daughters and reside in Atlanta, Georgia. To learn more, visit AshleighSlater.com. Click the image above to join our Women Living Well book club on Facebook. This is beautiful, Ashleigh. I couldn’t agree more. I didn’t know this in the beginning of my marriage, but it is something that my husband and I have both learned over the years. When we hold onto the little things that annoy us, it colors our marriage in a way that is damaging and hurtful. When we learn to let the little things go, it makes all the difference. Like you, when I am irritated with my hubby, I think about what kind of husband I could have, about how wonderful he really is, and I thank God for him. Thank you for these wise words. Thanks for your kind comment, Heather! This is the principle of Philippians 4:8. When we chose to focus on whatever is true, whatever is honorable, whatever is fair, whatever is pure, whatever is acceptable, whatever is commendable- if there is anything of excellence and if there is anything praiseworthy and we keep thinking about these qualities this is what we become fixated on. My husband is very good at doing this with me and I have learned from him how important this is in our relationship. Exchanging this type of love is a very powerful way to communicate with each other. It is intimate, loving and healing. His eyes light up when I tell him, “I adore you”. Thank you for the insightful words Ashleigh!